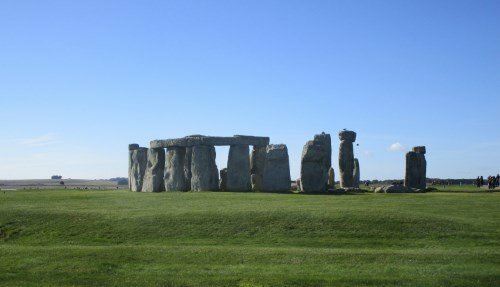 A guide to the best Stonehenge tours from London, for those looking to visit this stunning UNESCO World Heritage Site. Stonehenge is located a few hours drive from Central London and is one of the most popular places to visit in the UK. Each year thousands of visitors come to admire this ancient Neolithic site, considered to be one of the most mysterious places in the world. There are so many different tours to Stonehenge, that sometimes it can be overwhelming to choose the right one for you! Our list of the best Stonehenge tours from London includes some of the unique ways of discovering the site, including at sunset, and we highly recommend one of our top 3 Stonehenge tour suggestions. Alternatively, there are many full day tours of Stonehenge from London that combine a trip to Stonehenge with other nearby sites such as Bath, Windsor Castle, Oxford, and Salisbury. This is the perfect tour for those looking to spend the most time at Stonehenge and Bath. The morning is spent at Stonehenge, with an in-depth explanation about its history and legends. The afternoon is then spent in Bath, with time to explore the Roman Baths, Bath Abbey and Georgian architecture. This is perfect for those who are looking for a slightly slower paced tour, with more time to appreciate each attraction. One of the best Stonehenge tours from London, it includes luxury transportation and an expert guide. 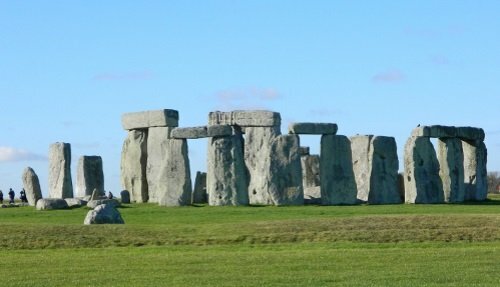 This is our favorite tour to Stonehenge and includes a visit to Windsor Castle and Bath. The tour operates with a maximum of 16 passengers which is ideal since it allows for greater interaction with the tour guide. The tour offers 3 departure locations from London and it also comes with cleverly modified mini buses which mean that no matter where you sit on the bus, you’ll get a great view of the countryside. Whilst more expensive than most Stonehenge tours, we think that the quality of the service makes it well worth it! Capture the magic of Stonehenge with a visit to the site at its most mystical hours. Marvel at this magnificent structure as the sunlight quints and glimmers as it passes through the ancient rocks. This is the best way to see Stonehenge because you’ll actually get access to the inner circle. (Most Stonehenge tours only include a viewing from afar, and you don’t get up close). 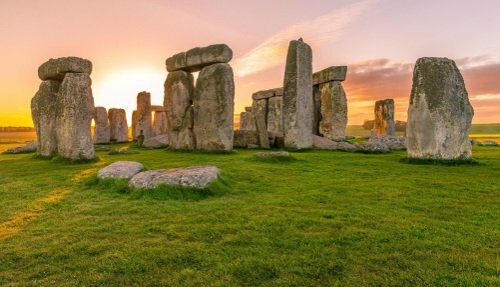 You’ll get to see the extraordinary structure and to appreciate the peace and quiet that descends upon Stonehenge during sunrise/sunset hours, which seems to cast this ancient Neolithic creation under a magical, unforgettable spell. The first place to check is here. This company tends to offer most availability and includes a visit to the Roman Baths and the Cotswolds town of Lacock. Choose between a basic ticket and a ticket that also includes a two-course meal. The tour includes transportation and a professional guide. The second place to check is here. This company also offers a Stonehenge special access inner circle tour. The tour departs from Salisbury in the afternoon, but there are regular trains that go to Salisbury from London and it possibly the most comprehensive and all encompassing Stonehenge tour you’ll find. The company uses a truly expert guide and you’ll get to see the Durrington Walls, inner circle, barrows, and free time at the visitors center. You’ll come away from the trip feeling like a true Stonehenge epxert! It’s a very exclusive tour that is offered about 15 times during the summer months so make sure to book early! The third place to check is here. This company offers an almost identical tour to the first company with visits from London to Bath, Lacock and the Stonehenge inner circle. Again, it’s offered on very selected dates during the summer months and includes a tour guide and luxury transportation from London Victoria Coach Station. For those looking for a truly unique Stonehenge experience, then go for the sunset tours with private inner circle viewing. This is the probably the most extraordinary time to visit Stonehenge since the sun has a way of casting a mystical spell over the site. Most tours only view the stone circles at Stonehenge from afar, but these tours which actually get you inside the stone circles for a close up look! An unbeatable experience! For those looking for a full day taster experience, including a visit to Stonehenge, we would recommend our Stonehenge, Windsor Castle & Bath. This is perfect if you want to get a good taste of England, and are happy to spend a short amount of time at each location in order to see as much as England as possible. One of our best Stonehenge tours from London, this tour combines history, archaeology, architecture and heritage. It spans the Neolithic period all the way to the Roman and the Middle Ages and through to the Georgian period and modern day Britain. For those looking for a slower pace full day from London, we would recommend the Stonehenge & Bath day tour. By visiting just two places this gives you more time to fully appreciate each site. When visiting Bath, you also have the opportunity to set your own pace according to your needs and interests. Bath is known for its excellent restaurants, cafes, gorgeous architecture, ancient Roman baths, and magnificent Bath Abbey. Learn about the legends of King Arthur on this Stonehenge, Glastonbury & Winchester King Arthur tour. This small group tour of up to 16 people departs every Monday and Friday from Central London. As well as a visit to Stonehenge, you’ll visit Glastonbury Abbey and the Great Hall at Winchester Castle – two sites connected with the Arthurian tales and legends. This bestselling tour also includes a visit to the beautiful gardens at Chalice Wells and some breathtaking sweeping views over the English countryside from Glastonbury Tor. Spend the first part of this trip on a tour of London with a visit to some of the most famous landmarks. Start with a visit to Parliament square, followed by Big Ben and a tour of Westminster Abbey. From here you’ll be transported from London to Stonehenge via an express coach service for a self-guided tour of the site. It’s the perfect tour if you want to combine London sightseeing and Stonehenge into one single day. This is the perfect tour for those looking for a rich and diverse day trip from London. This tour combines the mysticism of Stonehenge with great British heritage at Windsor Castle, beautiful English Georgian architecture at Bath and the picture postcard village of Lacock. The perfect tour if you are looking for a true taste of England. It also includes lunch at Lacock in a 14th Century pub. This is a full day tour of Stonehenge, Windsor Castle, Bath & Lacok with daily departures from Central London. Tour includes luxury transportation and a professional tour guide. This is another small group tour from London with a maximum of 16 passengers. It includes entrance to the Roman Baths, a guided tour of Stonehenge and a taste of the Cotswolds with a visit to the village of Lacock and a drive through the Cotswolds countryside. The tour is available every Tuesday. Another one of our best day tours from London, this time including a visit to Windsor Castle and Oxford. Oxford is renowned for its beautiful university colleges, courtyard, and gardens, as well as its rich architectural heritage. The tour departs from Central London, including a professional guide and luxury transportation. One of the best Stonehenge tours from London, the day begins with a visit to Stonehenge. You’ll have a private talk at the site by an expert guide, who will take you through the extraordinary history and heritage. This is followed by lunch at the Stonehenge visitors centre. From here, we head to Salisbury, a cathedral town. We visit the Cathedral, which boasts the highest spire in Britain and holds one of the original Magna Carta documents. Finally, we head to Bath for a panoramic tour of the city and free time to explore. 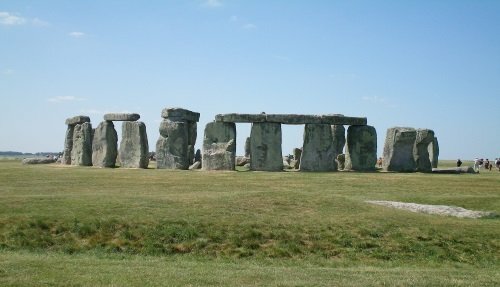 This Stonehenge, Bath & Salisbury Tour departs from Central London and includes lunch at Stonehenge. A full England in one day tour from Central London to Stonehenge and into the heart of Shakespeare country! Having visited the stone circles at Stonehenge, we’ll head to the Cotswolds, one of England’s prettiest regions that is characterized by beautiful thatched roofed cottages and honey-coloured stone buildings. Finally, we head to Stratford-upon-Avon, the birthplace of William Shakespeare. We’ll visit the school where Shakespeare studied with an exclusive behind the scenes tour. Finally, end the day with a delicious fine English tea including champagne and scones! Hampton Court Palace is one of the finest English country estates! It boasts magnificent cloisters, courtyards, and stunning gardens. Having enjoyed an exclusive morning, behind-the-scenes tour, we then head into the English countryside to Stonehenge. 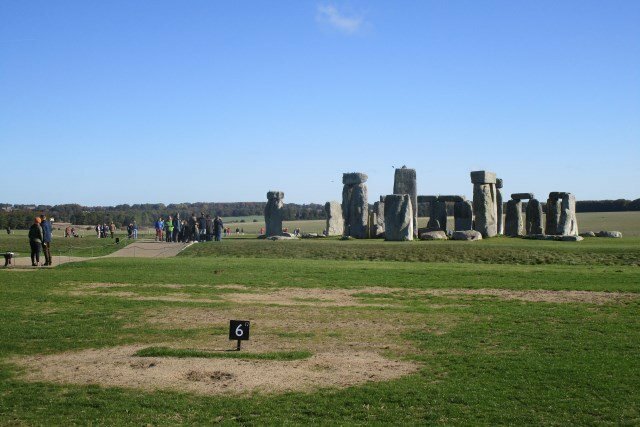 The visit includes lunch at Stonehenge, where you can choose from an excellent selection of food at the visitors centre. Finally, end the day with a stop at the Georgian city of Bath, with an expert guided tour of the city, followed by some free time to explore the pretty streets, Roman Baths, Abbey and magnificent Georgian architecture. For those looking for the easiest way to get to Stonehenge from London, this low cost direct bus is available every day departing Central London in the morning or afternoon. The visit to Stonehenge is self-guided, but excellent audio guides are provided, with commentary available in multiple languages. Starting from just £39 per person, this is perhaps the best value for money way of getting to Stonehenge from Central London. Tourist England also offers the best fully customizable private tours to Stonehenge from London. Our dedicated team are here to build the perfect tour that suits your needs and interests. Choose to combine a visit to Stonehenge with other nearby attractions. Stonehenge tours from London come in many different shapes and sizes. 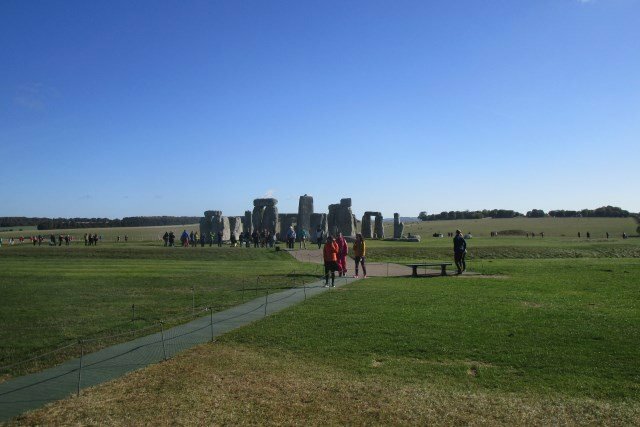 From the most basic half day Stonehenge tour to tours that combine a Stonehenge visit with other nearby attractions and truly unique experiences such as the sunrise tour. We offer a great selection of the best Stonehenge tours from London that will suit your interests and passions. Below are a few more additional details that might give you greater insights into what to expect on a visit to the Neolithic site, as well as practical information about the tours, the audio guides and the Stonehenge cafe. For more information and questions check out our travel information page or please feel free to contact us and one of our dedicated staff members will be happy to answer! All Stonehenge tours depart from Central London at London Victoria Coach Station. This is the major center for coach tours departing from London. It is easily accessible as it is located next to Victoria station, which is serviced by the London underground and overground trains. All our tours use luxury coaches that are fully fitted out with air conditioning and free wifi. Our experienced drivers will greet you at London Victoria coach station and will be your dedicated driver throughout the day. Occassionally, during peak season, we might put on extra coaches that do not use wifi. All Stonehenge tours (with the exception of the half-day Stonehenge visit) comes with a professional guide. We choose tour guides that are not only extremely knowledgeable about Stonehenge, but are also really passionate about the subjects and work hard to make your day as enriching as possible and give you the best Stonehenge tours from London! The Stonehenge Cafe provides excellent food, with gorgeous views over the Stonehenge landscape. The café serves soup, vegetarian and traditional pasties, sausage rolls, sandwiches, salads and wherever possible uses locally sourced produce. The cafe also accommodates various dietary requirements including vegetarian and gluten free options. Some of our best Stonehenge tours from London include lunch at the cafe, where you can choose from one of these delicious options. There are a few, highly exclusive, tours to Stonehenge from London that include a private viewing of the inner circles. Most people don’t realize that most of the bus tours to Stonehenge only include a visit to Stonehenge from afar, and this can be rather disappointing to the more avid and enthusiastic Stonehenge admirers. Whilst extremely exclusive, there are several inner circles that will get you a far better perspective and an idea of the site. There are two options available for audio guides. Stonehenge offers a free audio tour that can be downloaded onto your smartphone, via the App Store or Google Play store. There is a free wifi available in the visitors centre but it’s recommended to download the app before you arrive. Alternatively, audio guides are available on the site (and as part of the best Stonehenge tours from London are included in the price of the tours). These excellent guides are available in several languages including English, French, Italian, Spanish, German, Japanese, Mandarin, Russian, Dutch and Polish. Stonehenge is an ancient Neolithic site that dates back over 4,000 years. It is considered to be one of the great wonders of the world and attracts thousands of visitors each year to come to marvel at the magic of the site. Nobody is quite sure why the site was constructed, and what the stone circles were used for. Some suggest it was used for religious ceremony whilst others have suggested for burial. The site is still used by pagans and druids, who descend on the site for the equinox. You can read more about it on the official Stonehenge website. Our best Stonehenge tours departing from Central London take to you the site, where one of our dedicated tour guides will explain the rich history and heritage of this celebrated British monument. The road to Stonehenge. Can you see it in the distance? Stonehenge is located in the heart of the English countryside in a region called Wiltshire, about 90 miles from Central London. 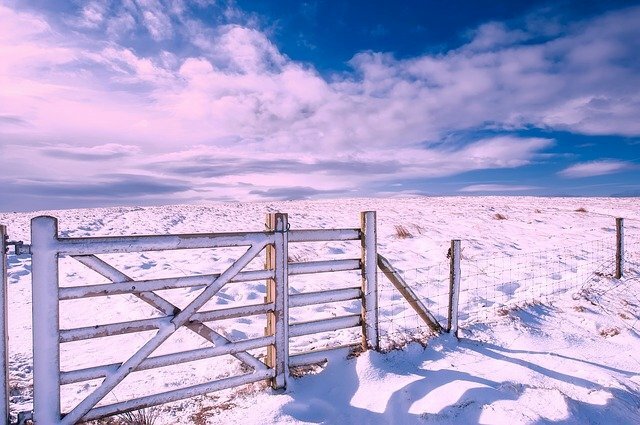 The drive from London takes you past some of the typical rolling hills and windy lanes that characterize the English countryside and are a marked change from the hustle and bustle of the city. On arrival, grab an entrance ticket, make sure to take an audioguide, and head straight to the Stonehenge bus. This is a free shuttle that takes you from the visitors centre directly up to the stone circle. Stonehenge is one of the most significant prehistoric monuments in England that dates back to 3100bc. At this time, ditches and holes were constructed as part of religious ceremony. By 2150bc, 82 stones, each weighing 4000kg were brought to the site, covering a journey of over 250 miles. They were then arranged to form an incomplete circle. Finally, about 2000bc more stones were brought to Stonehenge, this time from about 25 miles away, to form an outer circle, which was later rearranged into a circle and a horseshoe shape which is what we see today. As the shuttle bus rises above the hill, you’ll immediately be struck by the sheer scale and size of Stonehenge. The stones have stood in this place for over 5,000 years, and whilst they are not perfectly intact, it’s impressive how well they have survived. Many today debate why Stonehenge was built, with suggestions ranging from a place of worship to a coronation place for Danish kings and a centre for healing. The most widely accepted account is that this is an ancient temple aligned with the movements of the sun. Follow the footpath which snakes around to the right, and you’ll get to go quite close to the stones. Bear in mind that you are not actually allowed to enter inside the stone circle. Due to conservation reasons, the area immediately surrounding the stones is very fragile and therefore access is restricted. However, even from a small distance, Stonehenge is an impressive feat to marvel at! Top tip: If you really want to get up close to the stones, then take a look at our best Stonehenge sunrise or sunset inner stone circle visit. This gives the best views of the stones, and you can even touch them! Unsurprisingly, the number of special access tickets available are extremely limited, and so this tour get sold out months in advance. Book ahead to avoid disappointment! The path around the stone circle is clearly marked, and there are plenty of information points along the way that link to the audioguide. These useful maps, diagrams and pictures, along with audio information, help to chart the history of Stonehenge and explain in detail what you are looking at. They even try to provide answers to some of the biggest mysteries that surround the site. Top tip: The path around Stonehenge is at times unpaved and so gets muddy, especially in the winter time. Make sure to wear appropriate shoes that are fit for outdoor wintry conditions. 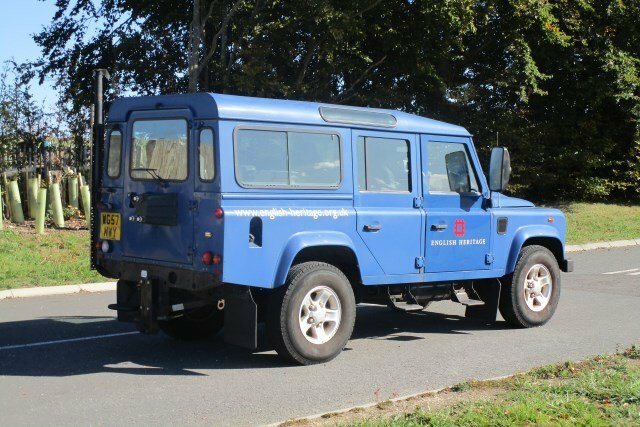 Having finished exploring the stones, take the shuttle bus back to the visitor centre. Here, you’ll find several rooms that link Stonehenge to its surroundings. There are ancient artefacts and archaeological finds that come from Stonehenge and the nearby hills. From pottery to human remains, the exhibition helps to put the site in context. 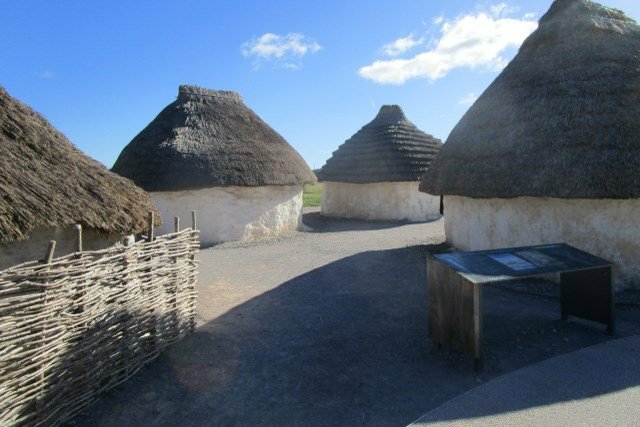 There’s even a reconstruction of what a typical Neolithic Village would have looked like. You can go inside these structures, and get a feel for Neanderthal life! The visitor centre also includes a Stonehenge inspired gift shop, with a choice of plenty of shirts, mugs, keyrings and notepads decorated with a picture of the stone circle. The actual experience at Stonehenge really depends on the weather, the time of the day and the season you choose to visit. Some of the most spectacular ways of experiencing Stonehenge include at sunrise or sunset, where the light begins to peek between the stones, and gives off an atmosphere that can be difficult to describe in words! It’s at these times that Stonehenge gets its nickname of being “mysterious”, “otherworldly” and “spiritual”. We discuss the best times to visit Stonehenge in this article. Top tip: Make sure to wrap up warm! 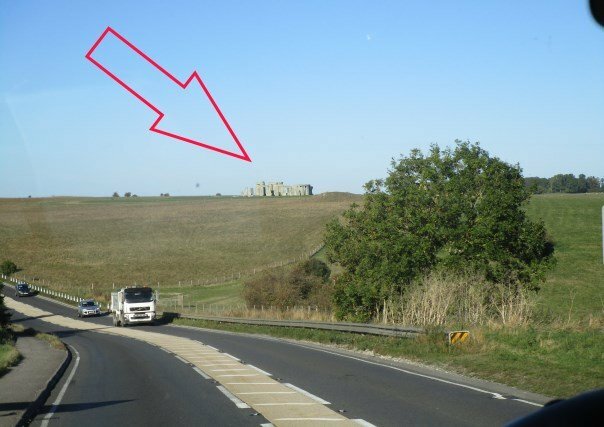 The temperatures can be very deceptive, as Stonehenge is located on top of a hill, and is exposed to the elements. Expect strong winds and a chilly breeze, even on days where it might seem quite mild. What do Bloggers Say About Stonehenge?